Texas Fire and Safety is Your Fire Extinguisher Company. All of our equipment meets or exceeds the requirements of American National Standards Institute (ANSI) / Underwriters Laboratories (UL) 299, or Underwriters Laboratories Canada (ULC) standards S504 and S508. We have the know how. As a member of the National Fire Protection Association (NFPA), the technicians at Texas Fire and Safety have expert knowledge of the established standards for portable fire extinguishers. Contact Texas Fire and Safety today to schedule a free fire extinguisher walk-through of your company. 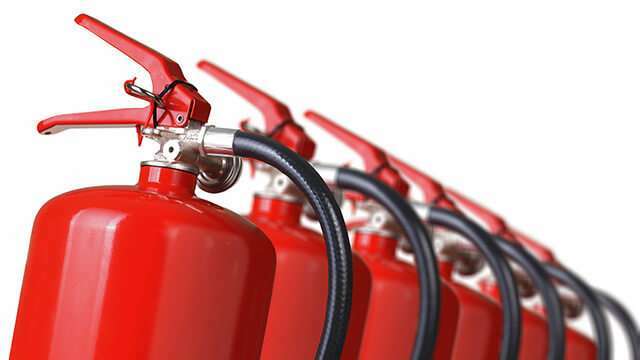 What is the right fire extinguisher for your need? When shopping for fire safety equipment like fire extinguishers, how do you know what to buy for your establishment? What do you need to consider in order to protect the diverse areas of your company, the diverse needs of your people, and the facilities occupied? Will you need dry chemical, pressurized water, clean agent, or K Class? How do you know what questions to ask to get the answers you need? NFPA 13 sets these mandates. Texas Fire and Safety is well-versed on these mandates. Fire extinguishers are categorized for the type of fire they will extinguish. Each type of fire requires a different and specific agent or substance to successfully put it out without causing more harm than a fire. Every company is a blend of people–different sizes, shapes, and capabilities. There are local, state, and federal rules and regulations in place intended to provide the best protection possible for virtually every scenario. Knowing and documenting (i.e. a fire protection plan or life safety strategy) the needs of your people in the event of an emergency such as fire, will help you get everyone out alive. It will assist emergency responders by providing them with critical rescue information as well. By knowing where employees who need special assistance are in your company, the faster they may be attended. This applies no matter who the occupants of your building–employees, patients, residents, guests, or the general public. There are a variety of agents used in portable fire extinguishers. These agents are used to fill an extinguisher canister and are labeled with operating directions that indicate their proper usage. Extinguishers are typically mounted to a wall for easy access. They should be at a level that is convenient to reach for anyone, even if in a sitting position. They may also be housed in a cabinet that is flush or mounted on a wall. Cabinets should always be easy to open. 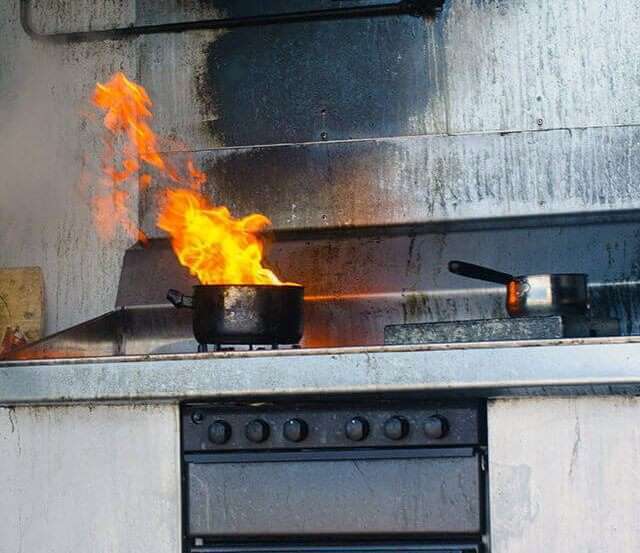 Kitchen fires have a special classification due to the varying substances that cause and feed these fires such as grease, oils, and food fats. Known as Class K, a kitchen fire should only be fought with a kitchen fire extinguisher containing a wet chemical that is designed to not only put out the flames but cool down the equipment or appliance itself without causing damage. In a data center housing sensitive computer equipment or even a museum housing priceless artwork or artifacts, a clean agent fire extinguisher containing substances designed to quickly evaporate and leave no residue, may be necessary. These are often large rooms where automatic fire extinguisher systems are beneficial, especially if these areas are not manned 24-hours a day. Where chemicals and electronic equipment are in use or stored, the best tools may be CO2 fire extinguishers which cover the B-C classes. 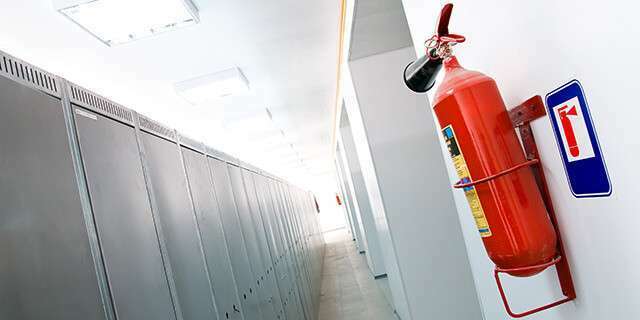 For larger areas like a medical or research lab, an automatic fire extinguisher system would function well engaging when certain conditions like heat, smoke, or odors are detected. In a small office or a room where heating food items or cooking occurs, such as a break room, multipurpose ABC fire extinguishers designed to handle A-B-C class fires, may suffice. These extinguishers are used for paper/trash, wood, or cloth leaving minimal residue. Professional fire extinguisher companies usually provide numerous services to customers. The top of the list should include regular fire extinguisher maintenance. A monthly visual fire extinguisher inspection should be performed to check for proper charge levels, pitting, corrosion, and leaks to ensure your equipment is ready to function in an emergency. 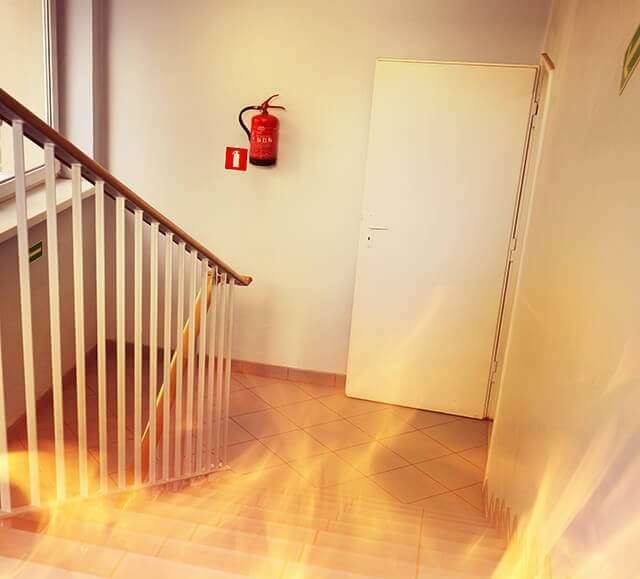 A more complete fire extinguisher service should be performed on an annual basis at minimum by a certified professional fire safety company such as Texas Fire and Safety. The visual inspection indicates the structural integrity of an extinguisher but to confirm there are no issues with content pressure from possible handling or environmental conditions, it is mandatory to perform pressure tests on all extinguishers as determined by the manufacturer. In order to get an accurate and complete measure of the function of any fire extinguisher, hydrostatic testing is required. This test places an extinguisher into a water chamber or jacket where pressure is applied at approximately 150% of the normal operating pressure for 30 or more seconds. Shells, hoses, and nozzles must also be pressure tested. Once determined to pass the test, the canister is refilled with the proper substance and returned to service. Extinguishers containing compressed gases must use this water type test. 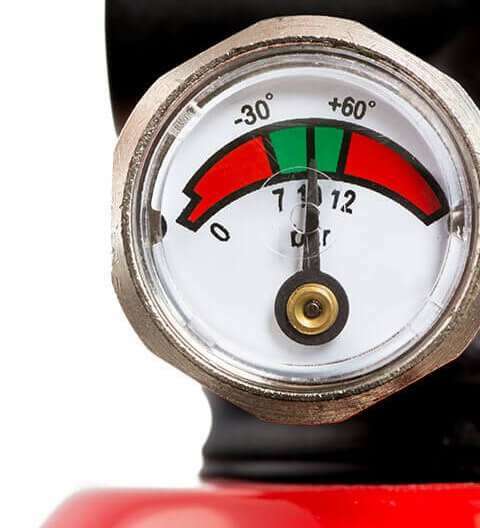 Non-compressed gas cylinders are allowed to be tested using a manual or powered hydrostatic test pump. Most extinguishers are required to be hydrostatically tested every five years, some every 10 or 12 years, depending on the type of extinguisher. These standards are set by the manufacturer in accordance with the U.S. Department of Labor (USDL) Occupational Health and Safety Administration (OSHA) regulations all designed to keep you and your business as safe as possible. All tested fire extinguishers must display an inspection tag noting the date of the inspection, person or company performing the inspection, and the serial number of the extinguisher. Just as critical as the fire safety equipment itself is the proper signage to mark the type and location of the equipment. And just as fire extinguishers are many and varied so are the signs. From reflective to lighted, surface mounted, ceiling mounted, 2D and 3D, bilingual to Braille, posting easy-to-read markers to quickly identify a piece of equipment or show where a fire extinguisher is located can save property and lives. If an extinguisher has a metal valve versus a plastic one, it can be recharged. It is acceptable to recharge fire extinguisher equipment if upon inspection the unit shows a low pressure or if it has been fully or partially used. This recharge process should be performed by a professional fire extinguisher company and can save on the cost of purchasing new equipment. Texas Fire and Safety offers mobile service for recharge of your extinguishers. Your equipment stays on property. Texas Fire and Safety chooses to represent top-rated fire extinguisher manufacturers including JL Industries and Ansul and their full lines of fire protection products. Portable Ansul fire extinguishers include their Stored Pressure, Wheeled, Cartridge Operated, and Clean Agent models. These may be wall-mounted units or low-profile units contained in a wall cabinet. Ansul also manufacturers fire suppression systems. JL Industries fire extinguisher cabinets are functional and discreet housing small and large extinguishers, as well as hoses for engineered systems. Decorative doors of glass or metal are optional.